September 19th, from 16:00 to 19:00. An international online orchestra developed by Apo33 whose goal is to create a venue for networked performance. The Great International Audio Streaming Orchestra uses a bi-directional multiplex platform to perform and mix different audio sources (streaming). 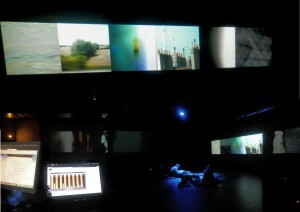 During the performance, streams (transmission) sent by musicians from across the globe are re-composed in the performance space or venue through a spatialization, based on a live streaming plateform adapted to mix multiple streams. GIASO creates a new form of orchestral composition where composers become virtual entities that emerge from a community of networked audio nodes and performers.